We put a little of this and a little of that into our compost bin. 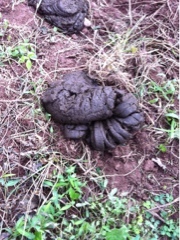 Cow pies go in and break down. Lots of sawdust from the sawmill around the corner. Not much in the way of food waste, as that goes straight to the pigs, who chow down on melon rinds, apple cores, peaches that have turned and stuff like that. When we process poultry there is not much left after. Most things have a use. The few that don't go in there too. 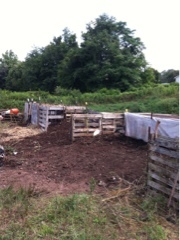 The other day Homer moved the compost from several bins down to 2. As he measures it, 14 yards of compost. The length, the width, the height of the pallets we use for our bins. 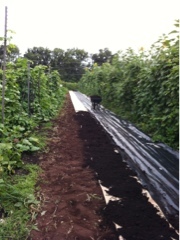 He pulled the parts that were done, that are black, rich soil and planted fall crops in it. Lettuce, Swiss chard, spinach, carrots, beets, radishes, some brassicas...all in. Right now it is all about tomatoes and beans. But in a few weeks it will be too cold for them and time for the cool hearty vegetables again.